Here's a delightful children's picture book that's a hoot to read and share. 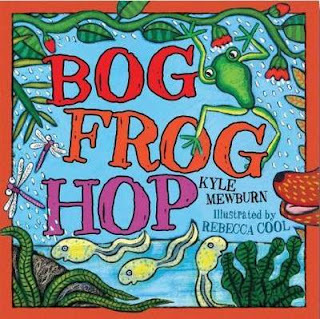 Bog Frog Hop was written by Kyle Mewburn, illustrated by Rebecca Cool, and published by Little Hare, an imprint of Hardie Grant Egmont. The soggy bog is home to ten polliwogs. They splosh and splash together in the rain and mud, until one polliwog turns into a frog. Now there are nine polliwogs in the soggy bog and one frog on the mossy log. As the rain continues to fall, more and more polliwogs turn into frogs and the bog comes to life with colour and sound. Even the local scriffy scruffy dog cannot resist the bog-frog hop! What a great piece for Reader's Theatre Bog Frog Hop would make! There are so many juicy, delicious words to savour, with a gorgeous cumulative refrain kids will enjoy. Drip! Drop! Rain drops. Glip! Glop! Mud glops. Sniff! Sniff! Woof! Woof! If you're a regular reader here at The Book Chook, you'll know that I LOVE Rebecca Cool's art work. I've mentioned her in Children's Book Review, Isabella's Garden, Now That's Cool, and Children's Book Review, For All Creatures. 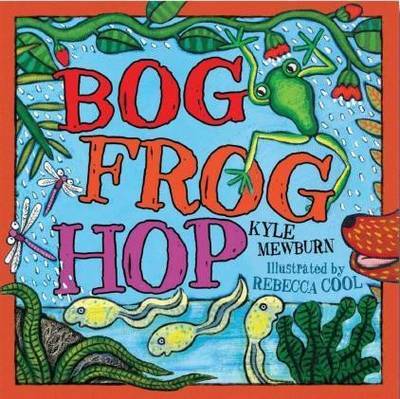 Her illustrations in Bog Frog Hop are bursting with life, colour and movement. Kids will find all sorts of interesting details and textures to notice and ponder over. I will need to get this one for my son. He loves frogs and loves "sound" words. Thanks for sharing. @Growing Book by BookSounds perfect for him!